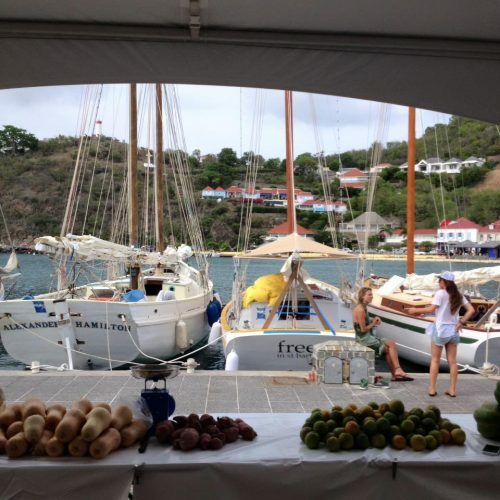 West Indies Regatta, St.Barths – Sampson Boat Co.
Every year in Antigua, a week after the Antigua Classic Yacht regatta, comes Antigua Race Week (bear with me here, I’ll get to the West Indies Regatta in a minute). Just when you think the season is drawing to a close, from nowhere come hundreds and thousands of small white plastic boats, and from them come hundreds and thousands of loud and competitive sailors. 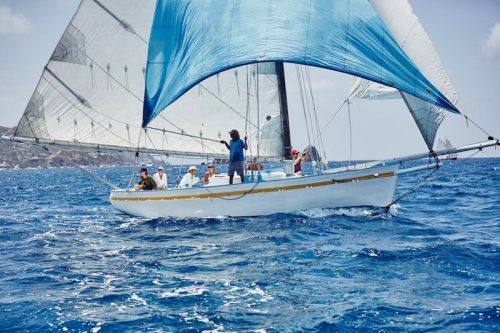 Now, don’t get me wrong – I enjoy sailing all kinds of boats, I enjoy racing, I enjoy partying, and I also appreciate that Antigua Race Week must be a massive boost for Antigua’s economy. Personally, however, after a long season and a busy regatta the last thing I want is to be surrounded by enthusiastic Brits wielding winch handles and arguing about if there was an overlap or not. Especially in the Caribbean, where the temperature is a clear indicator that any time is a good time to just lay on the beach with a book, or go quietly for a swim with a cocktail in hand. And so when the Race Week arrives, I depart. 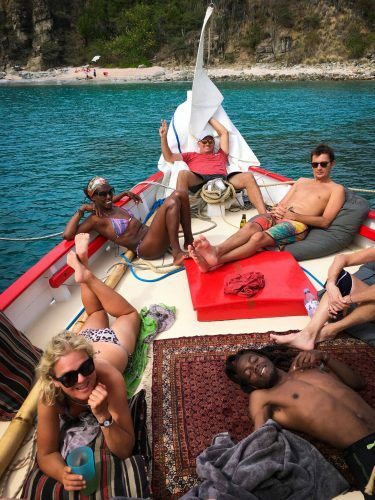 Conveniently, the West Indies regatta takes place at the same time, in neighboring St.Barths, so this year I took a little plane (I mean REALLY little – it was underbooked, so I was the only person on it other than the two pilots) and had a weekend away. 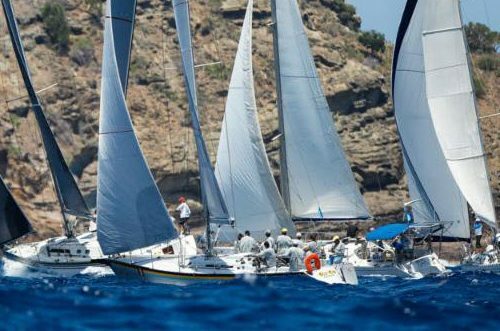 The West Indies regatta is the antithesis of Race Week. Traditional Caribbean working boats race fast, but they live slow, man. 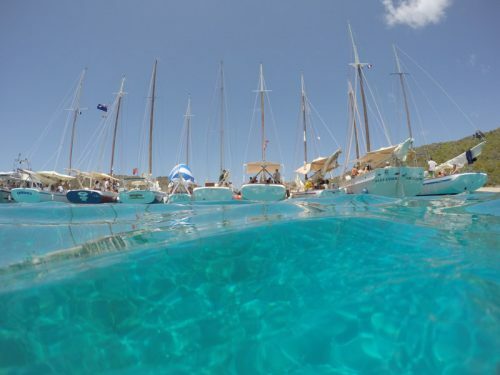 They cruise into St.Barths with bold colours roughly painted on their wooden hulls, often with cargoes of fruit and produce, animals and children. There are two days of racing, but most of the time even the race committee doesn’t know where or when each race takes place, and that’s just fine with everybody involved. I raced on Sweeheart, the smallest and one of the oldest Carriacou Sloops around. She used to work as a fishing boat, but now she lives on a mooring off Pidgeon Beach in Antigua. She is rough and ready, she leaks like hell, and she’s got a wonderful character. Two years ago I sailed her to and from St.Barths for the same regatta, and the return journey was one of the wettest, most uncomfortable trips of my life, but it was great nonetheless. This year I was put on the helm, where I was very happy. 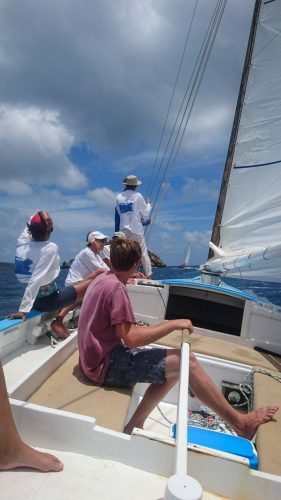 The conditions were ideal, and we hurtled around the small islands off St.Barths in a rough approximation of where we thought the course might be, usually following the others and hoping they knew better than us (with mixed results). We can usually see Genesis, Free and Zemi, who are all a similar size and speed, up ahead in the distance. Genesis is owned by Alexis Andrews, who started this regatta, and has put a huge amount of work into promoting these local boats, and the few people who are left building them on the islands. His film, Vanishing Sail, is well worth watching. Find info on the regatta and the film here. Having arrived at the bay where the finish line might be, all the competing boats raft up together, and lie on the largest boat’s anchor. 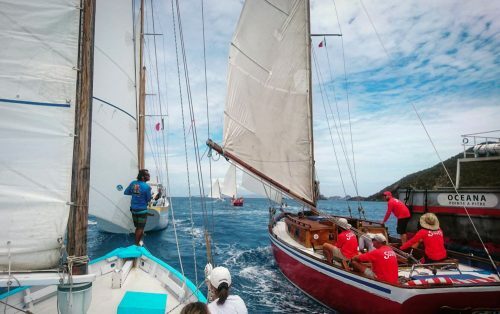 This is one of the finest traditions of the West Indies regatta, and I love to see all the crews mingling on each other’s boats, sharing picnics and beers, swimming and playing. It’s also refreshing to see lots of local islanders involved – this is their home, their regatta. 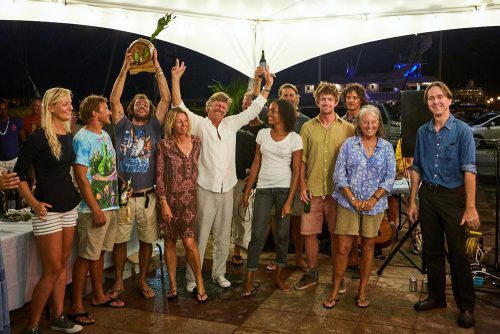 After a couple of days of sailing, the Antiguan band Sound Citizens played at the awards ceremony. Every boat that competes in the regatta receives a prize, and the atmosphere is clearly not competitive, with awards for the ‘best (and only) schooner’, ‘most children on board’, etc. We placed first on handicap, and partied the night away with great company in the torrential rain that erupted shortly after sunset. Just the way the whole of the West Indies was when I discovered it (and myself) 50 odd years ago. Thanks!